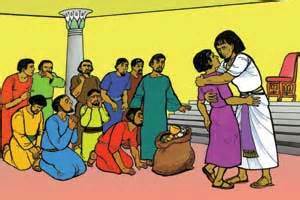 How come the brothers didn’t recognize Joseph? On occasion I run into a past student of mine, then in grade school and now a young adult. They obviously have changed, and yet, it doesn’t take long before we go, ‘Oh My G-d!’ and something along the lines of ‘you haven’t changed a bit!’ Same goes to high school and family reunions. Sooner or later, someone says, ‘wait, wait, aren’t you…’ I’m sure you’ve had the same experience too. Joseph was not a baby when the brothers sold him to a caravan of merchants, traveling south. He was 17; not quite fully grown, but a young man. To make matters worse, the caravan is described as “Yishma’elim”. Yishma’elim is currently used for just about anyone living in Israel who is not Jewish, but originally, it should have been reserved (as is today) for the descendants of Yishma’el. For Joseph, could that have meant that he was sold to his half-second cousins? Ok, “half second cousins” are not people we might associate with regularly, but this is not a big family. Surely they knew at least that they were somehow related!? How come no one said anything to Jacob? or told the brothers where they dropped Joseph? A man disappears for 13 years in the small region between Hebron and roughly Cairo, fully in the open, and no one knows his whereabouts?? Further, upon meeting him, the brothers don’t even suspect that he looks slightly familiar! I know, I know: he had a different hair-do and new clothing, and maybe even make-up. He was out of context. And at least initially, he didn’t socialize with them and maybe stood at a distance (although later when they bring Benjamin he shared a meal alone with them). But seriously!! Usually people who have given a child to adoption or lost a relative with inconclusive ending, forever keep calculating and looking in a crowd for that person. And here we have ten grown man, later 11, and no one sees anything? Women might have something to say here about men and density, but still the question remains: How come the brother didn’t recognize Joseph? Add to that, that he immediately knew them. Of course, they were much more conspicuous; he waited for them, they didn’t know he was there. And yet? Perhaps the answer can be found in last week’s reading: “And when his brothers saw that their father loved him more than all his brothers, they hated him, and could not speak peaceably unto him ; (Genesis 37:4). And immediately in the next verse: “And Joseph dreamed a dream, and he told it to his brothers, and they hated him yet the more” (37:5), and if we didn’t yet quite get how the brothers felt about Joseph, the text says again: “…And they hated him yet the more…” (37:8). Contrast this with Joseph’s personality. Joseph “sees”. Joseph sees dreams, just like Jacob did when he was younger; Joseph sees solutions, opportunities and, mostly, he sees G-d wherever he goes. No matter if he is in a pit, sold to slavery, a servant in a compromised situation, a prisoner or second to Pharaoh, life is a godly “wow” to him. The brothers, on the other hand, don’t see anything. The last time the verb “to see” is mentioned with them, is when they see Joseph coming and they conspire to kill him (37:18). It takes awhile before the verb to see shows up again, and it is when Jacob finally sees that “there is food in Egypt” (42:1). That “seeing” is what leads to the family’s meeting, resolution and ultimate reunion. Continue and hear Judah’s words when he asks their father to take little Benjamin with them (by the way, according to tradition, at this point, Benjamin was already a grown man and father to his own children). Judah implores Jacob, telling him that Joseph said: “You shall not see my face, unless your brother be with you.” (43:5). And last, after the emotional meeting and revelation (coming up next week), Joseph says to them: “And, behold, your eyes (now) see…” (45:12). I am struck this week with the blinding power of hatred; how much we miss when we let ourselves be engulfed in hatred! We don’t know what Joseph’s intentions were when he initially told the brothers his dreams. We “assume” he was a show off but the ones who read ill-will into his words were his brothers, not him. Perhaps Joseph wanted to share his joy at the fact that he sees them all together in the future! Up until now, always the younger one was “chosen” and the older one went off to establish another people. This is the first time all the children continue to be the “Children of Israel”, and obviously, one needs to be the leader. Joseph, as one of the younger ones, son of beloved Rachel, and a dreamer like his dad, was perfect for the task! But the brothers couldn’t stand him, and therefore couldn’t even imagine anything good in his words. Their hatred shut off their ability to see and hear him. Miketz, this week’s reading, is often read around Hanukkah. Again, there is darkness. Again, we have an opportunity to add a small light, to make a conscious decision to see. Shabbat Shalom & Haukkah Same’ach. This entry was posted in life and some, shabbat shalom, פרשת השבוע לחילוני האדוק and tagged beresheet, Genesis, joseph and his brothers, miketz, the power of hatred, Torah, torah portions. Bookmark the permalink. What an interesting and enlightening (pun intended) way to view this timeless story. While it has been 10 years since my son chanted this Torah Portion as he became Bar Mitzvah, Michal has once again illuminated the text with clarity and focus in a way that we hadn’t considered when studying this Parshah as a family. happy hanukkah to you and yours! miss singing all the lines of maoz tzur together!